God takes good care of me. I've been posting tidbits from our All About Me unit that we just wrapped up, and I realized that I am four units behind when it comes to blogging about our homeschool journey! Our nest unit was over a month ago. As always we have a wonderful time learning together. I didn't set up any trays for J-Bug this unit. He hasn't been too interested in his trays, and it occurred to me that I spend more time planning trays than I do JZ's kindergarten lessons. Until J-Bug shows interest again I won't be doing trays. He likes to tag along with us while JZ learns, and he enjoys crafting with us. 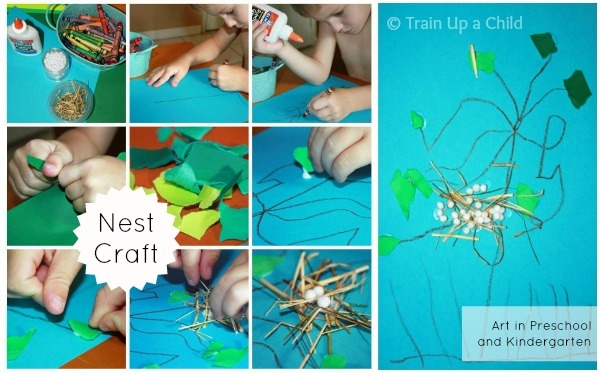 He made this simple nest craft. I had him cut scraps for the nest from brown paper. 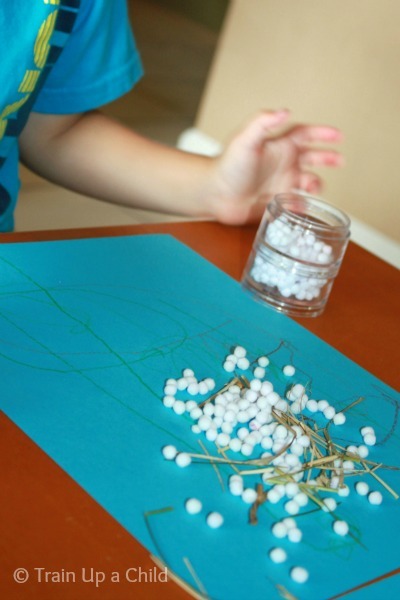 Next he glued them to the blue paper and added cotton balls to represent eggs. His end of the unit bulletin board was sparse, but he enjoyed himself. My favorite activity from this unit came from the MFW student sheets. JZ cut apart four pictures and put them in order. Then he glued each picture to a piece of cardstock, and staped the four pages together to form a book. He described each picture to me and narrated a story for me to write under each photo. He is being a goof in the photos, but he was very proud of his book. I especially loved when he saw the pregnant mama bird and said, "Her tummy got really big like yours when you had the babies." 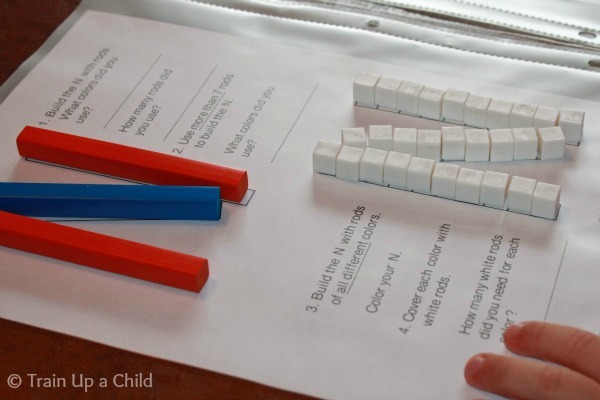 We mainly rely on manipulatives for math. Each unit JZ does one page from his Cuisinaire rods book. Another nest craft we did was a bit more involved. The boys drew a tree. Next they torn pieces of green paper and glued them to their tree like leaves. I loved watching JZ place each leaf intentionally. They glued dried grass from our yard in a small area like a nest in the tree. Then they use tiny pom poms to represent eggs. J-Bug dumped many "eggs" on his paper, but he didn't want to glue them. When he was done he picked up the pom poms and put them back in the container. Funny boy. 1. JZ cut letters and pasted the correct beginning sound under each picture. 2. He filled in his hundred chart each day. One day he held a small figurine and said the "bad guy" was doing his work. 3. He cut out animals and animal houses and paired them up with the correct matches. We have many birdie friends at our house. I don't know why, but our roof and deck seem to be very inviting to birds to build their homes. We enjoyed climbing on ladders to get a closer look at the nests. 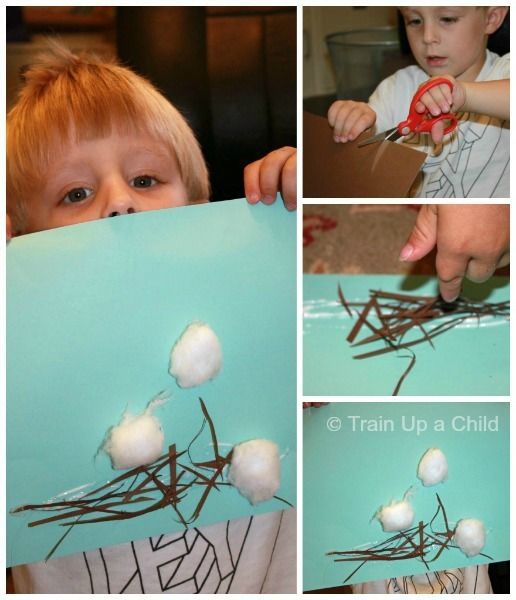 I shared a few fun activities over at Rainy Day Mum involving Edible Nests. 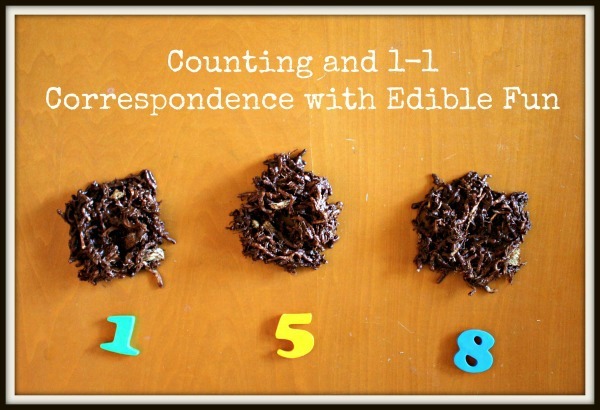 J-Bug worked on counting with our Edible Nests. JZ did some hands on addition and subtraction. Visit Rainy Day Mum for all the details. 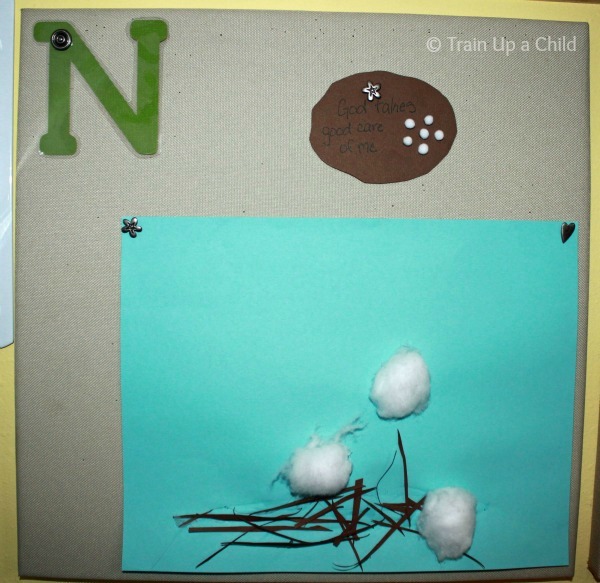 For more craft, learning and play ideas with a nest theme visit my Pinterest board Nn - Nest. What a delightful learning week! I love the simple egg craft at the top! Very simple and perfect for little hands! Whoops it should work now, thanks Dawn! 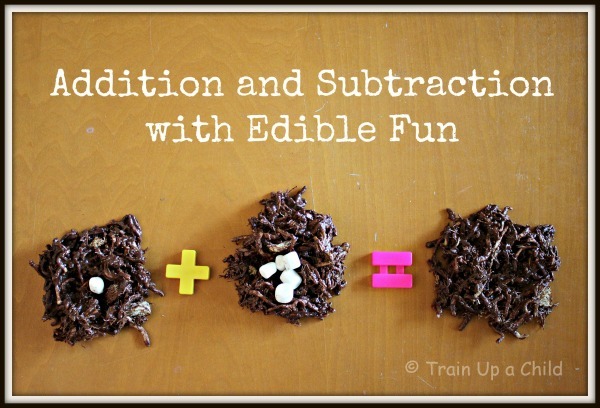 those edible nests look super yummy! this is so cute! 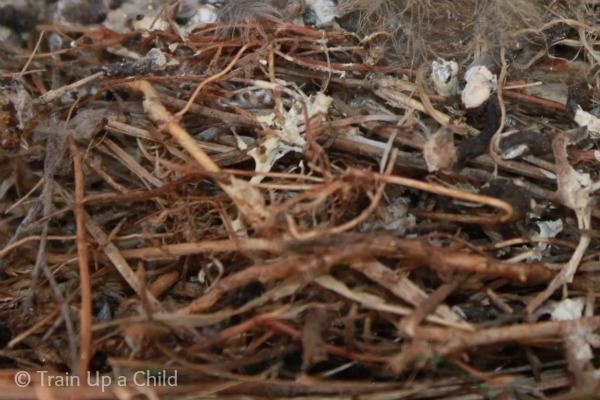 especially the math with the nests/eggs. thanks for posting! Looks like great hands-on fun as always!! This is great. We have been doing a lot of habitat learning with my 3 yo, so I love this post. 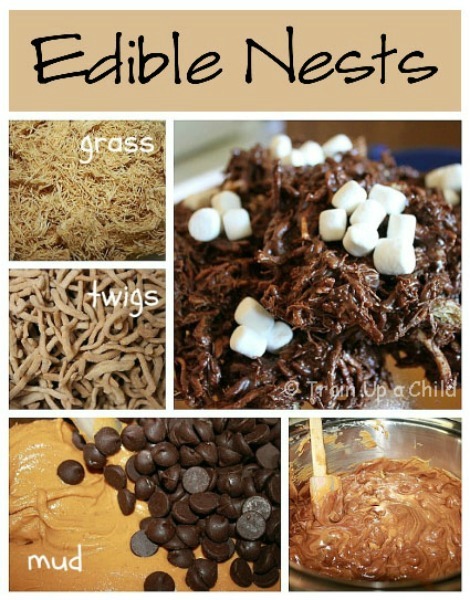 I think we will have to make some edible nests to go with everything else we have been doing about habitats. 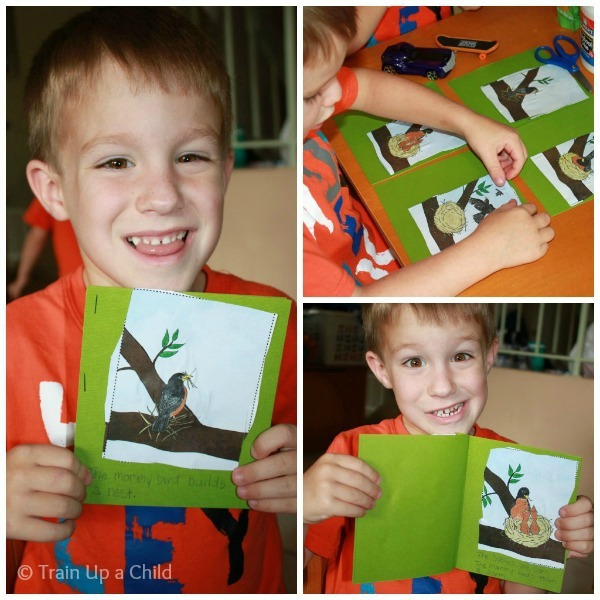 I am featuring this as one of my Kids Co-Op faves!